The comings and goings of Sheffield's urban peregrines, which first bred in 2012. 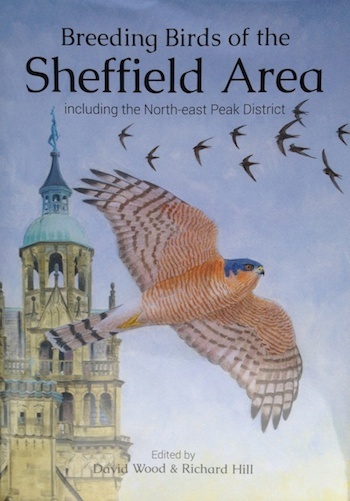 Updated by members of the Sheffield Bird Study Group. On Friday 18th May, an experienced team of ringers, working under a schedule 1 license, climbed St George’s church tower to ring the chicks. The timing of the ringing was a very close match to previous years in terms of age of the chicks, and carefully chosen to be within the fairly narrow window available to do so safely. Needless to say, the female – which had been feeding the chicks shortly before – kept a close eye on proceedings, circling the tower. On a couple of occasions she even perched up on the platform perch or one of the turrets before setting off again. The male was in attendance too, though he kept more of a distance. After carefully setting up ropes to secure those involved, Simon went over the edge to take the chicks from the nest and put them in a cloth bag before passing them back to the roof of the church. Once there, the three chicks were weighed and a series of measurements were taken, which suggested that we may have a female chick this year! DNA swabs were taken that will be analysed by the university’s Animal and Plant Sciences labs, as will the unhatched egg, which was removed from the nest at the same time. Each chick was ringed with a silver ring provided by the British Trust for Ornithology as well as a coloured ring to enable the birds to be tracked individually. This year’s chicks have PRA, PSA and PTA on orange rings, so do share any sightings of them once they’ve left the nest. As soon as this had been done, they were returned to the nest, and we climbed back down. Shortly afterwards, the female was back on the nest platform and things settled back down to normality. All of this is very positive, and is the result of many people coming together to protect these wonderful birds. And those rings are precisely what have told us that the male at Wakefield cathedral came from Sheffield, having been ringed as a chick at St George’s on 16 May 2014. Sadly, however, not all news in the last couple of days has been good. The same BTO rings that enabled us to confirm where one of the 2014 chicks has gone have confirmed that a Peregrine found dead near Bradford in suspicious circumstances was one of the 2016 cohort from St George’s. Peregrines are protected by law, but that doesn’t deter some people from continuing to persecute them. Whether or not this was the case here is unclear at this stage, but seems likely. Do keep an eye out for the Peregrines around Sheffield: they still need our support to ensure others can enjoy the spectacle of these magnificent birds in our skies. Following the emergence of the first chick on Monday evening, the last two days have indeed seen further eggs hatch, as anticipated. Having gone to bed on Monday with a ‘pipped’ egg alongside the chick, I expected a second chick to be present on Tuesday morning, but by lunchtime, little had changed as below. The afternoon did see the expected second chick hatch, coinciding with the male bringing in some prey to feed the first chick. The female’s reluctance to move aside over several minutes as he stood by with food in beak was puzzling, until a freshly pink chick became visible underneath the female’s wing; pink because the down was wet from inside the shell, although it wouldn’t take to long to dry and turn white. It wasn’t long before the male returned with some food, which the female seemed reluctant for him to feed to the chicks. Instead, she took tiny morsels from him and fed them to the older chick, the younger one not yet ready for a feed. By midday on Wednesday a third egg had hatched, all within a 48-hour window. Noticeable in the front of the box for most of the day (and in the pictures above and below) was a patch of heavy black plastic that had somehow blown up the tower and come to land in the nest. It’s a highly topical subject and a timely indication of how prevalent plastic is in our environment: Sir David Attenborough would not be amused! Once the male had settled back down to brood the plastic blew up and landed on his rump and wingtips. He seemed unsettled and startled but he did not leave his brooding duties and a short while later it blew off again and appears to have left the nest. Later in the afternoon, both parents brought food in for the chicks, at one point both at the same time! It looks as if they won’t go hungry, with Feral Pigeon already featuring. NEW FOR 2017! Click here to support the Peregrine Project at St. George's. Thank you! All donations are gratefully received. 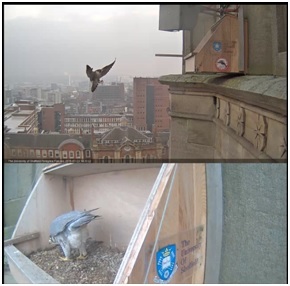 Click below to view the University of Sheffield's two webcams to see the birds live. Click below for details on how to purchase the SBSG's Breeding Bird Atlas. Join the SBSG to get involved with bird recording and conservation in the Sheffield area. Membership costs £14 per year, or is free to full time students and those 21 and under. See here for details.